There are about 5400 plant species grow in the mountains of Central Asia. The Chimgan Mountains are a spur of the Chatkal Range of the Western Tien Shan and also one of the richest areas in plant diversity in Uzbekistan. Some plant species such as Angelica brevicaulis, Bupleurum exaltatum, Daucus carota, Dictamnus angustifolius, Haplophyllum latifolium, H. perforatum, Ferula penninervis, F. prangifolia, F. tenuisecta, Heracleum lehmannianum and Prangos pabularia are found in the Chimgan mountains and they are used widely in traditional folk medicine to treat several diseases. Investigations of the phytochemical content of these species have led to the identification of bioactive substances such as essential oils, coumarins, flavonoids, sesquiterpenes and alkaloids. 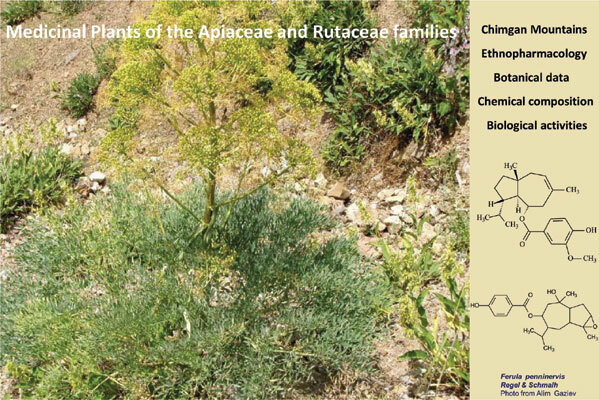 We summarized in this review the important reports on the ethnopharmacology, phytochemistry, and pharmacological properties of the species of Apiaceae and Rutaceae families from Chimgan Mountains as described in the literature from recent years (1959 to 2017). Uzbekistan, Chimgan Mountains, Apiaceae, Rutaceae, medicinal plants, ethnopharmacology, phytochemistry, biological activity.